A patient shot a doctor in a university clinic in Berlin on Tuesday before killing himself, but there were "no signs at all" of a link with Islamist militancy, police in the German capital said. Germany is on edge because of a spate of violent attacks on civilians by men of Middle Eastern or Asian origin since July 18 that have killed 10 people. Islamic State militants claimed responsibility for two of those four attacks before Tuesday. Berlin police said the doctor had sustained life-threatening injuries in the attack at the Benjamin Franklin campus of the Charite university hospital in the southwest of the city and died shortly afterwards. They added that the situation at the hospital in Berlin's Steglitz district was now "under control" and investigators were on the scene to determine the background to the crime. People return to the university clinic in Steglitz, a southwestern district of Berlin, July 26, 2016 after a doctor had been shot at and the gunman had killed himself. Police stand outside the university clinic in Steglitz, a southwestern district of Berlin, July 26, 2016 after a doctor had been shot at and the gunman had killed himself. A police car is parked in front of the university clinic in Steglitz, a southwestern district of Berlin, July 26, 2016 after a doctor had been shot at and the gunman had killed himself. Police walks at the university clinic in Steglitz, a southwestern district of Berlin, July 26, 2016 after a doctor had been shot at and the gunman had killed himself. People wait outside the university clinic in Steglitz, a southwestern district of Berlin, July 26, 2016 after a doctor had been shot at and the gunman had killed himself. Special police stand outside the university clinic in Steglitz, a southwestern district of Berlin, July 26, 2016 after a doctor had been shot at and the gunman had killed himself. 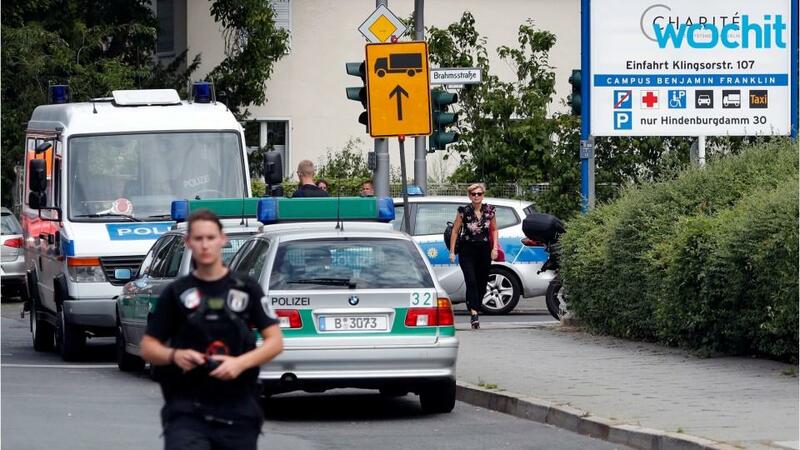 Police secures the area near the university clinic in Steglitz, a southwestern district of Berlin, July 26, 2016 after a doctor had been shot at and the gunman had killed himself. "There is currently no danger," police said on Twitter. Winfrid Wenzel, a spokesman for Berlin police, said the crime took place in the jaw surgery area of an outpatient clinic where the doctor was in a treatment session with the patient. "In the course of the consultation, the patient pulled out a gun and fired several shots at the doctor. The attacker then directly turned the gun on himself and died as a result of the shots," Wenzel told Reuters TV. "We do not have a single indication that this crime was motivated by extremism or Islamists."